All repairs are performed by Leonard J. Taube a master clockmaker with over 35 years of experience repairing clocks and watches. 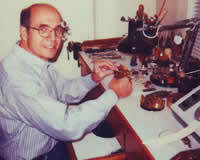 Mr. Taube has over 20 years of experience as a master clockmaker with the Chelsea Clock Company, Chelsea Massachusetts. Originally apprenticing in Russia, Mr. Taube immigrated to the US in 1980. He comes from a family of clockmakers dating back to the turn of the century.